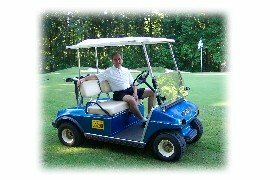 We are in the process of selling our used Club Car golf cart and buying a used electric golf cart. Either way it is important to determine how much we should sell our golf cart for and how to recognize a good value for our next golf cart. Living in a golf cart community makes it much easier to determine prices and values since there are lots of used golf carts on the market - through private individuals or through used golf cart dealers. If you live in an area where there are golf cart dealers nearby, most of them carry used golf carts - they can be either refurbished golf carts or "as is." 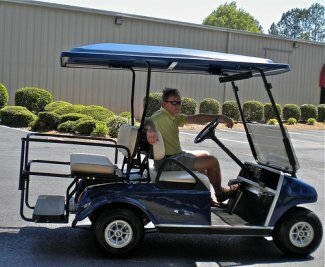 The refurbished golf carts usually have new windshields, tops, tires, headlights, batteries and new recovered seats if needed. Spend some time going to several dealers to check their inventory, prices and to take the golf carts for a test drive. Bring a pen and pad of paper with you and write down the year, make and condition of the cart along with the price so you can recognize a good value when you see one. Used golf cart dealers will take your old golf cart as a trade-in and then reduce the cost of the cart you want. However, most dealers will tell you that you will get more for your used cart by selling it yourself - which is what I plan to do. 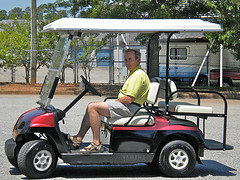 When we were test driving used (and new) electric golf carts, the dealers would ask if we had a golf cart to trade in. We told them that we wanted to sell our electric golf cart ourselves. Most of the salesmen were quite helpful in giving us an idea of what we could sell our used Club Car for. It helped us confirm the price range that we were thinking about. Some of the salesmen even gave us ideas on where to post ads for free. Thanks for subscribing to Golf Carts Etc. Newsletter.